Currently Cessna has only been releasing one range number for the Cessna Citation Mustang Range. The Cessna Citation Mustang Range is 1,150 nautical miles (nm) with 4 passengers and one pilot, when using the NBAA IFR 100 nm Alternate rule. Cessna also assumes that the Cessna Citation Mustang is at Maximum Takeoff Weight, Full Fuel, using a Optimal Climb and Descent profile and is using Maximum Cruise Thrust at 41,000 feet. Changes in these details will cause the Cessna Citation Mustang Range to change from the above number. 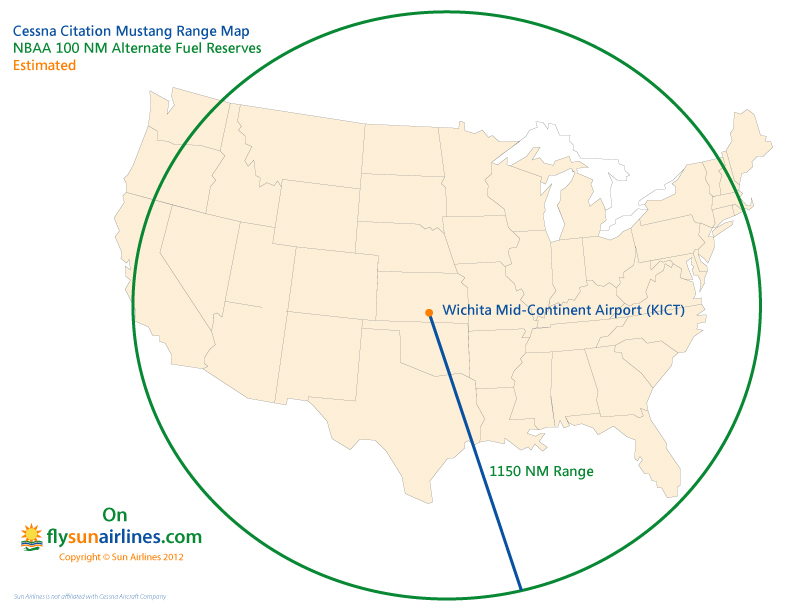 Below is a Cessna Citation Mustang Range Map from Wichita Mid-Continent Airport (KICT). Citation Mustang Range Map is an approximation/estimation. Above Cessna Citation Mustang Range Map Copyright. Cessna Citation Mustang Range is also known as Citation Mustang Range, Cessna Mustang Range, C510 Range, Cessna 510 Range, CE-510 Range, Citation Mustang Very Light Jet Range, Cessna Citation Mustang Aircraft Range, Cessna Citation Mustang Jet Range and the Cessna Citation Mustang VLJ Range.